Sharon DeBartolo Carmack is a Spiritualist Medium and Teacher. She creates the conditions that allow your loved ones in spirit to tell their unique stories and deliver their messages for you. In the process, they reveal such evidence as their distinctive personalities, memories, likes/dislikes, senses of humor, and speech patterns. Sharon has studied under a number of award-holding Spiritualist mediums, including Margaret Challenger, CSNU, former tutor at the Arthur Findlay College, and Paul Jacobs, CSNU, Andy Byng, CSNU, Simon James, MSNU, Brian Robertson, MSNU, and John Johnson, CSNU, current tutors at the Arthur Findlay College in Stansted, England, the world’s foremost school for the advancement of mediumship and the psychic sciences. Sharon has also mentored under Ginger Quinlan, Certified Medium of the Forever Family Foundation and a Certified Research Medium of the Windbridge Institute for Applied Research in Human Potential. Sharon is the National Representative for the USA of the Spiritualists’ National Union International (SNUi) and an SNU tutor for three courses. She is also enrolled in the SNUi platform accreditation program, working toward a Certificate (CSNU) in Speaking and Demonstrating as a medium. She provides only telephone readings at this time. For your convenience and later review, she records the reading and will provide you with a free digital recording of your reading. 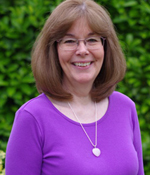 Sharon also teaches online mediumship development workshops and provides personal mentoring for her students. Visit Sharon's website, www.PathwaysUp.com, for more information, reviews, and testimonials. Please Note: Sharon does not provide psychic/intuitive readings that read your energy or predict the future. She does not give advice on relationships, finances, business, the stock market, or lottery numbers. She also does not identify or deliver messages from your spirit guides or guardian angels. Her readings are to provide you with messages and evidence that your loved ones in spirit are still with you.